This is a perfect cake for decorating and is moist and dense just like you’d find at a bakery. The cake will bake nearly even so that you don’t have to cut off a raised middle like some other cakes. It can be used for cupcakes as well as for loaf cakes. As pictured, these are cupcakes. I’ll add the full recipe for the cake sometime in the future, which includes a delicious homemade lemon curd filling. The recipe comes from Draegers Supermarkets, a high end supermarket in the San Francisco Bay Area. I worked in the bakery department in the early 1990’s and got the recipe while baking these cakes over and over from scratch. They have since stopped making these cakes, but they were very popular back then. I hope you enjoy this recipe as much as my friends and family. Enjoy! For a cake: Preheat the oven to 350 degrees F. Heavily grease and dust with flour three 9-inch round cake pans. For cupcakes: Place cupcake liners/papers in cupcake tins. This recipe will make 28-30 cupcakes. Zest one or more lemons to make 2 teaspoons of chopped lemon zest (the yellow part only, not the whites). Add the zest to the buttermilk, mix and set aside. These are your 'Wet Ingredients'. In a large mixer, cream together the butter and sugar. Add the eggs one at a time and fully incorporate before adding the other egg. Add the vanilla and extract and beat for about 2-3 minutes on high to get light and fluffy. Starting with the wet ingredients, and ending with the dry ingredients, add in small alternating batches to the butter & sugar mixture. Add about 1/4-1/2 cup of buttermilk, then add 1/2-3/4 cups of flour, then add the buttermilk, and lastly add the flour. Repeat until all ingredients are added. Beat for about 2 minutes. If baking cupcakes, pour the batter into the prepared muffin cups filling about 3/4. Bake at 350 degrees for about 15-20 minutes or until a toothpick comes out clean. Cool then ice with Lemon Buttercream Frosting. If baking a cake, pour the batter into three 9" prepared cake pans. Bake at 350 degrees for about 15-20 minutes or until a toothpick comes out clean. Cool then ice with Lemon Buttercream Frosting. 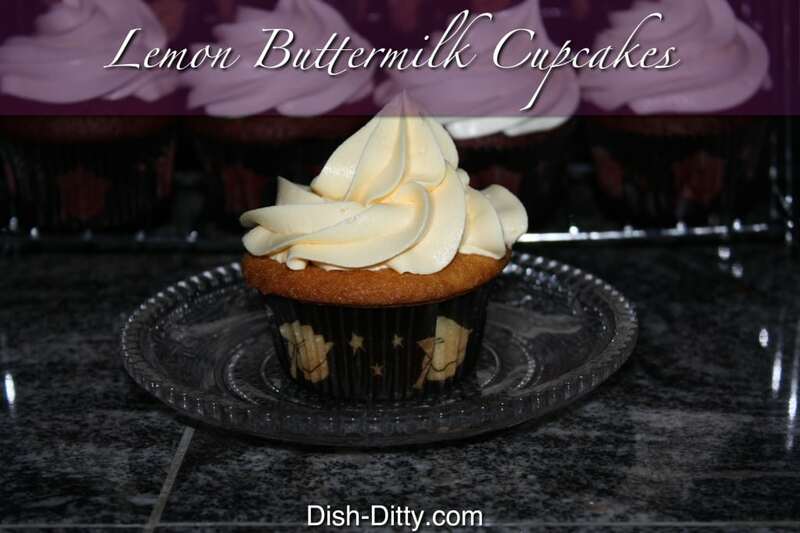 Use the instructions for the Lemon Buttercream frosting as shown in the Notes. LEMON ICING: Add the juice of one lemon to the frosting for a strong lemon flavor or 1/2 a lemon for a light lemon flavor. Add yellow food coloring to make a light yellow color. 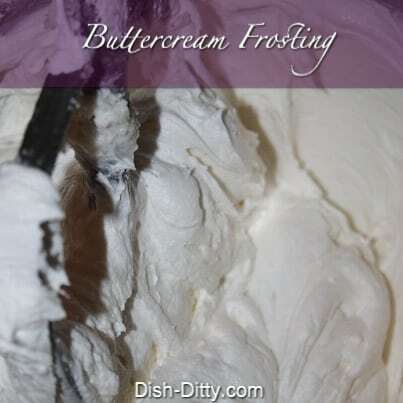 Beat butter and shortening until fluffy. Add vanilla and 1/8 cup of water. Beat until well combined. Using slower speed on mixture, slowly add powdered sugar. Increase speed to high and beat at high for about 5 to 10 minutes or until light and fluffy. Add more water to thin and more powdered sugar to thicken. I find that using the full 1/4 cup is the perfect balance for icing cakes, but I tend to add more powdered sugar to make it slightly thicker for decorating. 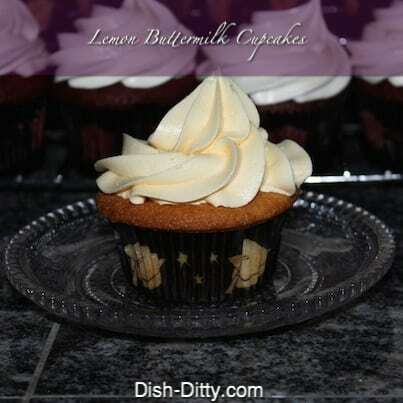 No Replies to "Lemon Buttermilk Cupcakes Recipe"